The food tech industry in India might be floundering, but this is food tech of a different kind. 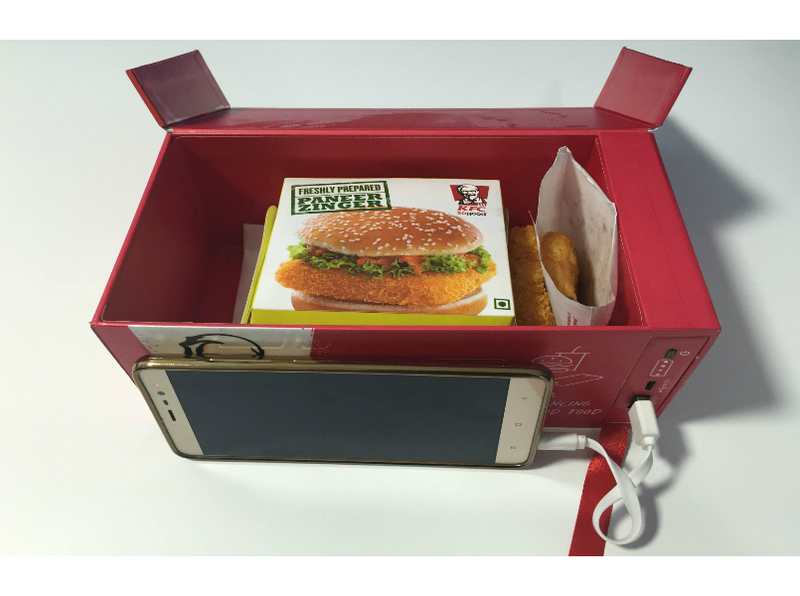 KFC has introduced a meal box that doesn’t just promise some good chicken, but also doubles up as a phone charger. Dubbed Watt-a-box, this meal box comes with a power bank with which you can charge your phone as you eat. The box is currently being offered in select stores in Mumbai for a limited period campaign. “We launched the 5-in-1 Meal Box in March this year with the objective of providing an abundant complete meal and at an affordable price for our customers. With the launch of Watt a Box, we have gone a step ahead and also introduced an element of utility into the box. Each one of us spends a considerable time on our smartphones daily, and the phone battery going dead is almost like a nightmare! No longer is that the case, with the Watt a Box around”, says Lluis Ruiz Ribot, CMO of KFC India. It sounds suspiciously like an April Fool’s prank, but it’s not – people have tried it out, and found that it works well enough to charge an iPhone to 17% battery in around 30 minutes. The Watt-a-box has magnetic flaps and contains a usual KFC meal, but has a power bank on the side. It also has micro-USB cables built in that allow you to charge Android or Apple phones. And the best part is that you can take the entire apparatus home with you.